Apart from whether you are an immigrant or British, if you are in a situation where you need help of a doctor, you have the right to demand the highest quality of service. If you have an accident, if you are a woman expecting a baby, you get sick or one of your loved ones goes to hospital - you should get professional medical help. Unfortunately, we must state that the standards of medical care provided can be different. Even in the UK there are cases of negligence caused by different motives, the consequences of which are serious and even tragic. It is important for you to know that you and your family have the full right to compensation when the hospital or its employee, a GP or even a dentist does not fulfil his obligations , apply the wrong treatment, ignore your case. Then you should contact the company Insito Claims, our professional consultant will help you fill out the form, estimate the options you have to win the battle of compensation and how much it will be. Just call this number 0208 940 0069 or fill out an application form on our website. 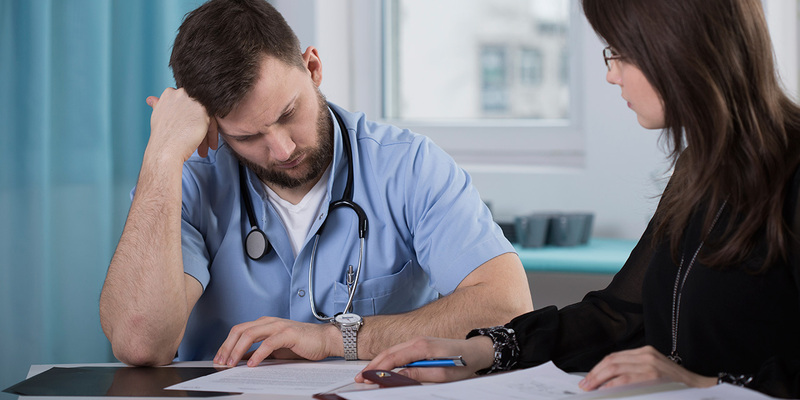 Issues related to the negligence on the part of health care institutions are quite complex and require experience in legal and medical knowledge. You should know that regardless of whether the doctor unwittingly or deliberately failed to fulfil his obligations, you can apply for compensation. Often, the complications which arise after surgeries, operations or improper diagnoses and treatment greatly affect our lives. Confidence entrusted to representatives of medicine has been shaken; instead of feeling safe and returning to normal, it gets worse. As a result of these actions we have problems with work, we are exposed to additional costs, we devote time to rehabilitation, which could be avoided. There are many aspects that can be considered as negligence on the part of the hospital: perinatal complications, poor diagnostics, brief interview with the patient, inaccurate examinations, poorly kept records and so on. In the process of obtaining compensation, we also have a wide range of possibilities. The courts, when determining the amount, take into account, for example: the costs that a person incurred in connection with the deterioration of health, loss of career options, one's personal situation, suffering and pain, when it comes to disability, as well as all costs incurred by the victim for equipment, adaptation of housing and car. You have three years to report the issue. There are also circumstances in which we can apply to extend the period when you were not able to figure out that a medical error influenced the deterioration of your health.